KITGUM – Uganda People’s Defence Forces (UPDF) will be celebrating its 38th Tarehe Sita anniversary in Kitgum district. 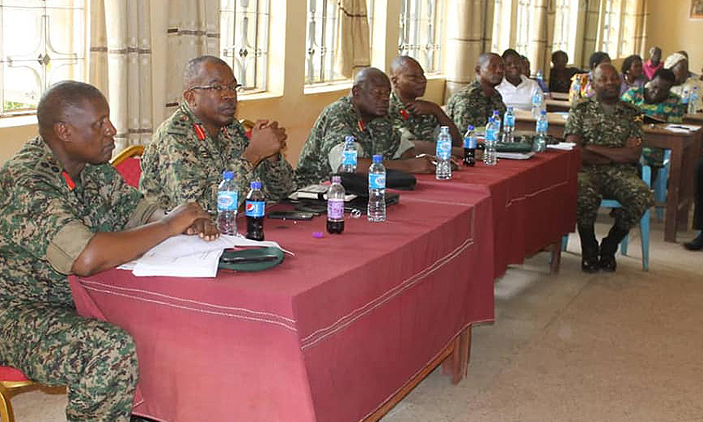 In a statement issued by Lt. Col. Deo Akiiki, the army deputy spokesperson, there was a meeting between the UPDF and local district leaders on Tuesday at the Kitgum Town Council Hall and the locals expressed pleasure and welcomed the decision. UPDF holds the anniversary February 6, every year and Tarehe Sita marks the birth of the National Resistance Army (NRA)/UPDF and also the launch of another phase in the struggle by the population against misrule in Uganda. Under the theme; ‘UPDF and the People: Consolidating Peace For Sustainable Development and Prosperity’, this year’s anniversary will be celebrated at Kitgum Core Primary Teachers College. While addressing the meeting, the UPDF Chief Political Commissar, Brig. Henry Masiko, asked the people of Acholi region to work hand in hand with the UPDF to bring peace and stability in the area. During the Army Week to be launched on January 29, the UPDF will conduct symbolic civil military activities in the whole country, with main activities taking place in the eight districts of Acholi sub-region of Kitgum, Agago, Pader, Gulu, Amuru, Lamwo, Nwoya and Omoro. During the meeting chaired by the Kitgum Resident District Commissioner, Chris Omara, the leaders applauded UPDF for peacemaking the whole country.